Partnerships with our community across Bucks County take many forms and yield extraordinary results. From galas to golf, proceeds from our signature events and fundraisers benefit the patients and families we serve and connect us with our closest friends and supporters throughout the year. Doylestown Health Foundation gratefully acknowledges the many individuals, families, corporations, foundations, and local businesses for their steadfast support. We are pleased to celebrate the generosity of our community by sharing these highlights. Doylestown Health Foundation is proud to recognize the individuals and organizations who have hosted events to benefit our patients, services and programs. 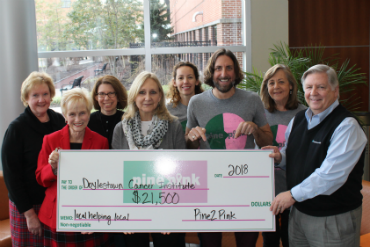 Thanks to the financial support of sponsors and local businesses, Pine2Pink Foundation representatives along with their founder, Keith Fenimore, were thrilled to present a check for $21,500 to Doylestown Health’s Cancer Institute. These generous funds will be used to help cancer patients pay for costs associated with their care and provide support for treatment and complementary therapies. Delta Kappa Gamma Society International is an organization of outstanding women educators. The Alpha Nu Chapter of Bucks County made a generous donation of books and hand crocheted blankets to support Doylestown Health’s Healthy Beginnings Plus program which provides medical assistance and pregnancy-related resources to expectant mothers and families in need. 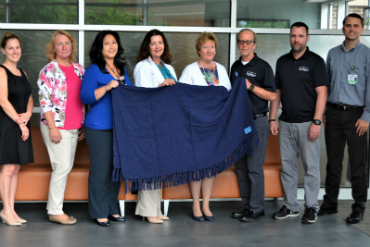 Fred Beans Subaru, Subaru of America and The Leukemia & Lymphoma Society (LLS) teamed up to provide more than 60 blankets to patients undergoing cancer treatment. Craft and activity kits were also donated for children and/or siblings during their stay at Doylestown Hospital. 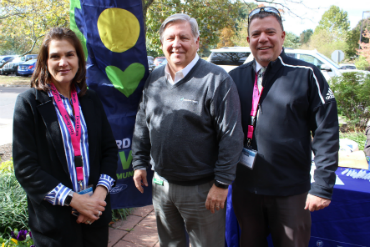 More than 175 Doylestown Health employees and visitors attended the Ford Drive 4 UR Community event, sponsored by Fred Beans Family of Dealerships, held on October 24, 2018. The event raised more than $3,500 with proceeds supporting ONE VISION: The Campaign for Doylestown Health. Local realtor, Deana Corrigan and her team at Realty One Group Legacy hosted a celebrity bartending event at Chambers 19 Bar and Bistro in Doylestown on November 7th,, 2018. Deana and her team presented a check for $2,000 which will be used to help purchase wigs for patients of Doylestown Health’s Cancer Institute. 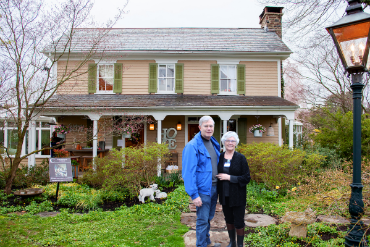 The Bucks County Designer House is the largest fundraiser for the Village Improvement Association of Doylestown. The VIA presented a $230,500 check to Doylestown Health. The proceeds from its 43rd Annual fundraiser will benefit the new Center for Heart and Vascular Care. The Women’s Club of the Heritage Creek Community Association partnered with the Town and Country Players Theater for a fundraising performance of “Bonnie and Clyde: The Musical, ” raising $1,000 for Doylestown Health’s Cancer Institute. Funds will support women undergoing cancer treatment at Doylestown Hospital. 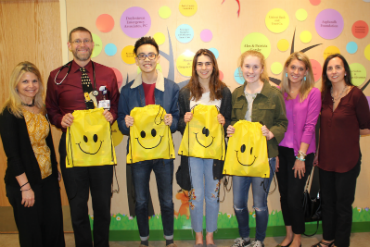 The Simple Gifts Project donated “Smile bags” to the Della Penna Pediatric Center. 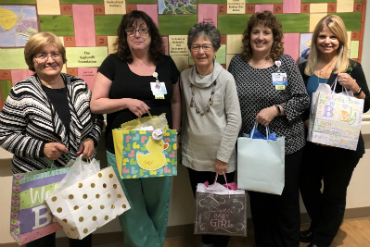 These gift bags, to be distributed to young patients by Doylestown Hospital staff, include craft supplies, stickers, and/or a book or toy to help relieve some of the anxiety of being at the hospital. 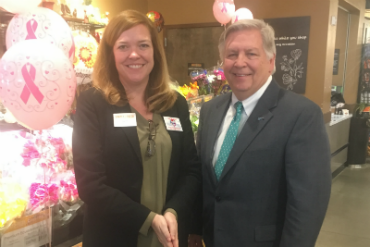 Simply Fresh by McCaffrey’s hosted their 3rd annual Fight Cancer Day on October 17th, 2018. They offered in-store specials and raffle prizes to the community and donated five percent of that day’s net sales. 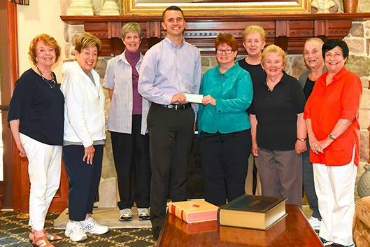 McCaffrey’s presented a check for $3,900 to benefit Doylestown Health’s Cancer Institute. CB West and CB East girls’ soccer teams held their annual “Kick for Pink” event on September 26, 2018 at War Memorial Field at CB West. 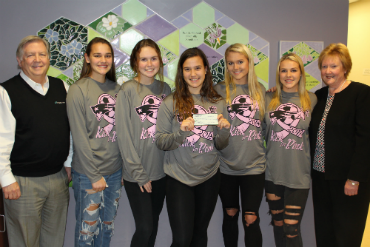 This year, representatives from the two teams presented a check for $3,935 to support breast cancer patients at Doylestown Health’s Cancer Institute. CB West and CB East girls’ volleyball teams held their annual “Pink Out” game on October 15, 2018. 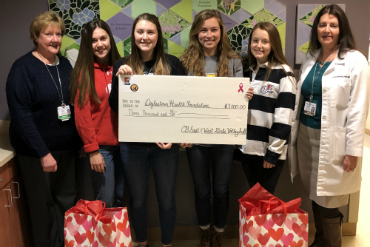 The two teams coordinated fundraising activities and presented a check for $3,000 for the Breast Cancer Fund, supporting programs related to the prevention, diagnosis, treatment, and support of patients at Doylestown Health’s Cancer Institute. 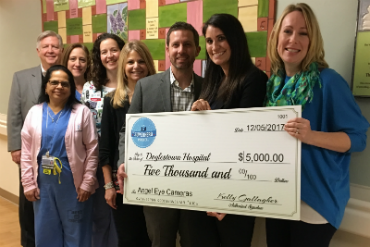 Leaders from The Superhero Project donated $5,000 to Doylestown Health’s VIA Maternity Center to establish the Angel Eye Camera System to keep parents connected with newborns in the Neonatal Intensive Care Nursery via a secure internet-based video camera. Smith’s Auto & Truck Service organized a breast cancer awareness fundraiser during the month of October. 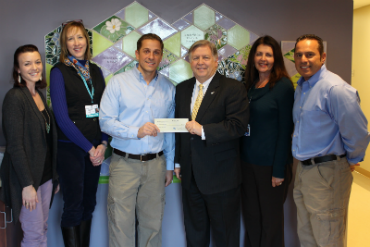 For each state inspection during the month, Smiths Auto & Truck Service donated $25 to Doylestown Health. 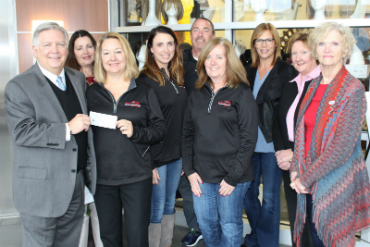 Smith’s Auto & Truck Service presented Doylestown Health’s Cancer Institute with a check for $4,100 benefiting the Breast Cancer Fund.